Dubai Golf, which manages the three leading golf clubs in the Middle East- Emirates Golf Club, Dubai Creek Golf & Yacht Club and Almouj Golf in Muscat, Oman- has chosen Jacobsen to supply golf course maintenance equipment and golf cars in 2016. This is in addition to the existing five-year preferred supplier agreement between Dubai Golf and local Jacobsen dealer, Luxury Carts Arabia. “Our partnership with Jacobsen goes back many years. 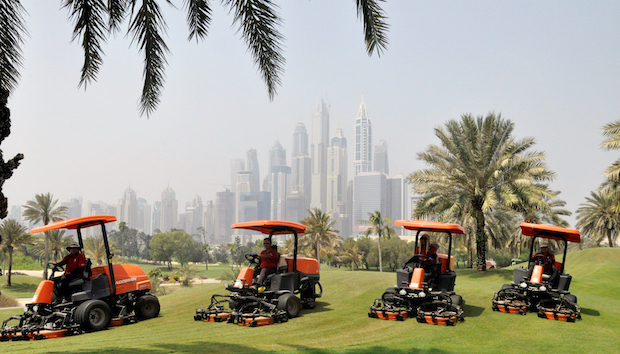 Dubai Golf and Jacobsen share the same values on customer care, quality and reliability. The partnership between the two companies is going from strength to strength because we share a mutual understanding of each other’s needs. The Jacobsen equipment we use on the Dubai Golf courses are able to cope with the conditions in the Middle East and they do a superb job for us. Emirates Golf Club is home to the Omega Dubai Desert Classic and the Omega Dubai Ladies Masters, the longest running professional tour events in the region. Emirates Golf Club was the first all-grass championship golf course in the Middle East when it opened in 1988. The course features 36 holes of world-class golf, and the club sports two of the city’s finest must-play courses, the Majlis and the Faldo Course, which is also the only 18-hole course in Dubai to offer night golf. Both courses combine the natural rolling desert terrain. The Majlis Course has been presented with numerous accolades over its 28-year history, including its 2016-17 ranking by Golf World magazine as one of the ‘Top 100 Golf Courses in the World’ and being awarded ‘Best Course Middle East’ in the Asian Golf Monthly Awards in 2015. Emirates Golf Club was also the first golf club in the MENA region to receive GEO Certification.